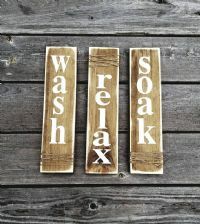 They measure 3 1/2" wide x 14" tall and are stained and the lettering is done in a white paint on a 3/4" thick pine board. Twine has been added to the top or bottom depending which one it is. The edges have been distressed for a nice rustic look. Each pine board will have its own beautiful unique character. They will each have a hanger on the back.